Engage customers with a beautiful, fully responsive interface. Customise the fonts and colour schemes to your liking. Instantly implement your favourite template and colour scheme - All templates can be implemented in just a click and automatically adjust to your customers' device display. Your customers will love our dynamic, fully responsive interface. Templates are easy to implement and even easier for your customers to navigate - from any device. Switch designs and colour schemes whenever you want. All packages come with a free Wildcard SSL Certificate to protect your eCommerce website and your customers' data. Your site is kept safe in our geo-redundant data centres. Offer your customers multiple shipping options for a seamless shopping experience: free shipping above a certain order value, standard shipping for a fixed price, or same-day delivery for a small premium. Once that is set up, you just have to organise a shipping carrier, like Shippo. Why build your shop with 1&1 IONOS? Run your store from anywhere and any device. Whether you decide to sell on one platform or many, managing your inventory is never complicated. Administration is centralised in the Control Panel. You'll never be charged transaction fees or surprise costs, and your shop will always be compliant with latest regulations, such as the GDPR and Geo-blocking Regulation. Integrate more 1&1 IONOS solutions like Online Accounting, and dozens of other apps and plugins to tailor your shop to your business’ needs. Customers sell their products with 1&1 IONOS eShop because there are no surprises: no surprise costs, product limitations, or data loss. Unlike free platforms, 1&1 IONOS eShop guarantees your customers' data is kept safe. And with marketing tools and convenient payment and delivery options, you're sure to keep your customers returning. How long does it take to build an eShop? If you want to open an eCommerce store, the eShop solutions from 1&1 IONOS can help you to minimise the amount of time it takes. The package includes everything you need – no HTML or CSS knowledge necessary. However, there is a CSS editor for professional users. All that is left for you to do is choose the right design for your shop, made easy with a large number of design templates for various business sectors. All details are easily changed and adjusted to fit your specific requirements: navigation structure, buttons, graphics, texts, pictures, banners, logos and YouTube videos. We don't just want to make building your eCommerce website easy, but also fun. If you need help, you can simply turn to our design assistant which will lead you step by step through the set-up process. With our new and improved solutions you can set up and start selling within a few hours. What do I have to consider when choosing the URL of my online store? Your personal online shop needs an internet address that is unique and memorable. (Domains are not free any more.) Perhaps you already have an idea of what you would like the name of your company or shop to be – reserve the corresponding domain now. You may purchase the domain before or after you purchase your preferred online store package. 1&1 IONOS provides new top-level domain extensions and aids in checking the availability of a suitable URL. Enter your desired web address into the search bar to see whether a suitable URL with your shop name is available. If you are building your own eCommerce website, you need to choose a distinctive shop or company name for your domain, but if you cannot find a matching domain name that is free you can also use well-known product names, important product categories or service names for your domain. To make sure your unique domain name is exclusive to you, reserve all the major domain extensions like .com and .net. This way you can protect your brand from the start. If you are building an international online shop, country specific domain extensions make sense – for example .co.uk (United Kingdom) or .fr (France). After you have set up your online store, do not forget to connect your domain. You can easily do that in the 1&1 IONOS control panel. How do I optimise my web store for smartphones and tablets? All packages include responsive web design. This technology ensures that your web store is displayed optimally on every smartphone and tablet, including any changes you might make over time. These changes are usually made using the internet browser of your computer – thanks to responsive web design they are immediately adopted and optimised for every smartphone. By the way, good performance of a web shop on mobile devices is a ranking factor for search engines like Google, making mobile optimisation a real opportunity to stand out from the competition. This is especially pertinent if the competition fails to optimise the presentation of their online shop for mobile devices. Optimising how your eCommerce website is displayed also gives you access to an entirely new group of customers – those that like to shop on the go. How safe is the eCommerce hosting in regards to payment transactions, data protection, and crashing? If you are building an eCommerce store that is hosted by one of our data centres, the exchange of data is automatically secured via an SSL certificate. The certificate guarantees the safe exchange of information and data when an order is placed on your website. Unauthorised access is prevented by encrypting the data transfer, allowing your customers to enter their information into a contact form during the order process without any risk. The entire checkout process is SSL-secured, from the order basket to finalising the order. 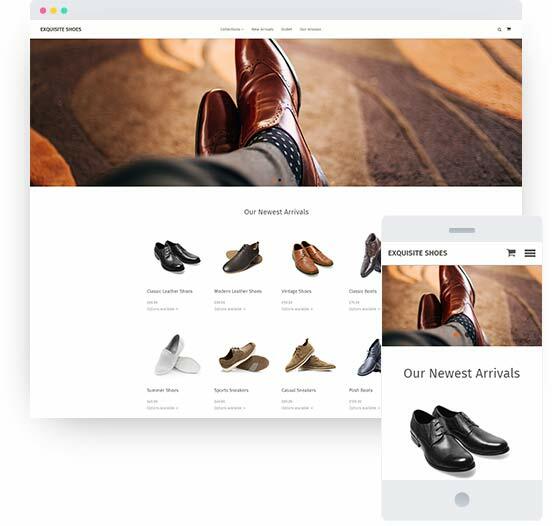 With 1&1 IONOS you can easily build an eCommerce website that is safe for your customers to use. The Trusted-Shops logo, which is attached to all of our shops, lets your customers know that they can trust your shop. Online shops that carry the Trusted-Shops certificate guarantee safe payment transactions with SSL encryption. Additionally 1&1 IONOS eCommerce web hosting protects your shop from crashing by employing a number of server locations. eCommerce hosting at 1&1 IONOS you make use of geographically redundant data centers. The use of server-cluster-systems – two geographically separate servers – ensures that you have round the clock access to your website. Should one server fail the other takes over all functions with no disruption in the system. The two servers mirror the data and synchronise it permanently. Should a webserver of your eCommerce website be offline, to undergo maintenance for example, the other server takes over. This means your shop is always accessible – for you and your customers. Regular backups further prevent any data loss. Opening an eCommerce website is subject to certain legal regulations. What do I need to know? The laws surrounding eCommerce stores change constantly. To make sure you do everything right and remain within the legal framework when you are building your eShop, 1&1 IONOS has entered into cooperation with Trusted Shops, the quality seal for online shops. All online shops that carry this seal are obliged to fulfil the highest standards of data and delivery security. For customers, the familiar Trusted-Shops seal with the blue "e" guarantees that your online shop is trustworthy. The SSL-encryption of the payment process is part of these regulations. With our eShop solutions you can create an online shop that fulfills the requirements of the Trusted-Shops seal. Trusted Shops certifies shops in accordance with the current legal framework and the most important customer-centric values. Along with the Trusted Shops certificate you will also receive a template of all relevant legal documents plus the terms and conditions. These templates are regularly updated to comply with the current legal status so you are always up to date.